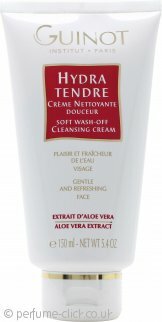 Guinot Hydra Tendre Soft Wash Off Cleansing Cream is a rinse off facial cleanser, which eliminates impurities, leaving the skin clear and healthy. Because of the Hydre Tendre soap free formula, it neutralises the effects of lime scale contained in water, thereby avoiding tautness after washing. It is ideal for sensitive skins but not suitable for dry or dehydrated skins. •	It enhances the skins delicate protective layer. •	It prevents moisture loss. •	Can be used as shaving foam. •	Excellent for removing heavy makeup. Hydra Tendre is also ideal for men. A man's skin is naturally oily so to avoid shine and to regain a healthy complexion, the skin should be perfectly clean before use. This cleansing cream is light, fresh and goes a really long way. I've had my first tube for over 6 months and I only just need to order a new one having used it twice a day for 7 months. Absolutely gorgeous it has really helped me look after my skin better. I have been using this product for many years and it is certainly the best I have ever used. It is soft, velvety and smells lovely. Also cleanses well and removes make up. Fabulous Service once again from perfume-click. The response time is great along with offering premium products such as this for an excellent price. I love Guinot & its nice to find somewhere that offers these products at these prices.